This self-contained solid-state amplifier covers the 80 MHz to 1000 MHz frequency range and features lowered distortion and improved stability through the use of push-pull circuitry. When used in conjunction with an RF sweep generator, this amplifier can provide 1000 watts (min) of swept power. Ideally suited for applications requiring instantaneous bandwidth and high gain, the 1000W1000F solid state amplifier is a versatile and powerful signal amplification tool. It’s equipped with a Digital Control Panel that includes a digital display, menu assigned soft keys, a rotary knob, and four dedicated switches- all designed to give the user local and remote control of the amplifier. 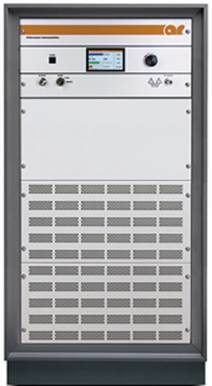 The amplifier is housed in a single equipment rack and provides complete stand-alone performance for RF testing. It weighs approximately 275 lbs (124.8 kg) and is (W x H x D): 56.1 x 127 x 83 cm (22.1 x 50 x 32.4 in) in size. For more information, download the datasheet or contact AR directly.